1 Why Do You Need a Gun Cleaning Kit? 2 What Do You Need To Clean? 3 What Do You Need in a Kit? It is well known that a firearm has only two enemies: rust and politicians. We will avoid dealing with the latter in this article, but keeping your firearm in tip-top shape is not hard at all with today’s selection of gun cleaning equipment and chemicals. There are so many great options, in fact, that navigating the massive selection of gun cleaning kits available online or in stores can be a daunting task for a newcomer. The market is practically flooded with new products every year; some gimmicky, and some innovative. It is obvious that you want to get the most for your money, and to do that it is going to take lots of research and testing. Thankfully, I have already done all of that for you! If you want to learn more about what makes a great gun cleaning kit, then keep reading! Why Do You Need a Gun Cleaning Kit? If you honestly don’t know the answer to this question, then just go to the range a few times and you will figure it out for yourself. The fact of the matter is, ammunition is dirty. Even the most top shelf, expensive ammo you can find is going to leave fouling and residue all over your gun. Cheap ammo, such as Tula or Wolf steel case or military surplus is even worse, and some varieties can even be corrosive! With this ammo, it doesn’t take long at all for your barrel and chamber to be coated with fouling. Even if all you do is store your firearms and never shoot them, they still collect dust and dirt, and can even rust unless you keep them in a dry place. All of these factors can cause major issues with your firearms, both long-term, and short-term. Short term, you will find that your firearm has many more malfunctions. Residue can build up on the firing pin and spring, which can cause light primer strikes that fail to fire the round. In semi-automatic firearms, it can also build up in the action and (if applicable) gas system. With the tight tolerances found on today’s precision firearms, it doesn’t take long for this to gum up the action and cause a failure to cycle. Over the long term, rust can cause pitting in your barrel and can wear down your rifling. While this may not prevent the firearm from functioning, it will certainly decrease your accuracy, even to the point where it may become dangerous to shoot your firearm. A few dollars spent now on a gun cleaning kit could help prevent you from spending hundreds down the road on a new barrel. In order to keep your firearm in the best condition possible, you will need to clean absolutely everything. This includes wood and polymer, but most importantly, metal. Wood and polymer parts are typically not essential to the basic operation of the firearm, such as stocks and grips. These will still need to be cleaned in order to keep your gun looking nice, but you will want to be careful with how you clean them. Getting some types of solvents in a polymer frame can actually cause it to melt. Wood and polymer are also much softer and easier to scratch than metal. You will want to make sure that you have a special rag and brushes that you use to keep these parts clean and in good condition. The parts you are going to need to give special attention to are going to vary widely by firearm, but every single one will have a few of the main basic components. One of the most important of these is the barrel. While a clean barrel does little to ensure smooth operation, it is one of the biggest components when it comes to accuracy. A rusted and pitted barrel is not going to be able to hit the broad side of a barn, and you will have to keep it clean in order to ensure that it doesn’t rust. If you have a gas-operated semi-automatic firearm, you will also need to make sure that the hole for the gas block is clean and free of debris. A fouled or clogged gas block is the cause of many malfunctions in semi-automatic firearms. The receiver is the other main portion of all firearms that will need to be cleaned. A receiver typically houses all of the other main firearm components: the fire control group, bolt, and magazine. Making sure you get your receiver and all of its components cleaned is going to ensure that you have a clean rifle that will function as intended. This is going to be one of the most important and time-consuming steps in your cleaning process and is going to require the most tools. When looking for a good cleaning kit, you will want to make sure that you get one that offers plenty of tools and materials to clean your receiver. What Do You Need in a Kit? The number of tools included in a gun cleaning kit can vary widely. Some of these kits contain everything but the kitchen sink, while others contain just the bare essentials. You will want to make sure that the kit you purchase contains everything that you need to clean the basic parts of your specific firearms and fill in any gaps with supplemental products. Just about every kit is going to include a basic set of bore cleaning tools. If you take a step up from there, you will find kits that include a few general utility tools, and maybe even a small bottle of chemical. Disassembly tools are sometimes included in a kit, but you will almost always have to purchase any specialty extra tools separately. While you can find several good starter kits that will have most of what you need, you should definitely plan on supplementing your kit with other items. Bore cleaning tools are considered the bare essentials for every kit, and you will find very few kits that don’t contain a few of them. You will need a few basic items to clean your bore. First, you will need a way to break loose stuck on carbon and fouling. After that, you will need a way to get all of the broken up fouling out of the bore, and keep it from rusting with a thin coat of oil. Finally, you will need a rod to push these tools through the bore. Bronze bore brushes are some of the most popular and common items in cleaning kits and for a very good reason. These brushes are very good at breaking loose stuck on fouling and carbon, and scrubbing the inside of your barrel good and clean. Add to that the fact that they are made of bronze, which means that they won’t scratch the inside of your barrel or wear it out. Any cleaning kit worth its salt is absolutely going to have a good selection of bronze bore brushes. I also use these brushes for cleaning much more than just the bore. In fact, almost any tubular crevice on a firearm can be cleaned with one of these. As such, I would highly recommend that you choose a cleaning kit with a full set of bronze brushes ranging from .17 caliber all the way up to 10 gauge. I have used my .17 caliber brush numerous times to clean pin holes and gas tubes. Nylon brushes are much less common than bronze brushes and for good reason. The nylon is much less abrasive and does nowhere near as good a job at breaking up stubborn fouling. They also wear out much faster than bronze brushes. The upside to this is that they are much gentler on your gun. While this is not a big deal when it comes to cleaning the bore, they can be handy for doing work on wooden or polymer frames. Nylon brushes are far from a requirement for a good kit, but they can be a great added bonus. Bore mops are designed to be used after the bronze or nylon brush in order to wipe the bore clean of all fouling. These usually look like a fuzzy cotton rod and come in the same sizes as the bronze brushes. My main use of bore mops is for cleaning shotgun barrels (they get much less dirty than rifle barrels) and applying a final coat of oil. Bore mops get dirty very quickly, so if you plan on using these exclusively I would recommend you either rinse them out very thoroughly after every use or purchase many spares. You will also want to make sure that you get a set that ranges from .17 caliber to 10 gauge, as these are very handy for cleaning gas tubes and pinholes in the same way as the bronze brushes. A bore squeegee is an innovative new product pioneered by Remington. This is a fantastic cleaning product that is made out of soft silicone and comes in a variety of sizes to perfectly fit every caliber. This is used directly after the bronze brush, and it wipes down the walls of your barrel perfectly, pulling a glob of solvent-soaked fouling out of the other end. In one pass, a bore squeegee can do what would normally take several minutes and a pile of patches. A good bore squeegee is, hands down, my personal favorite component of my cleaning kit. If the cleaning kit you ultimately decide to purchase doesn’t have one, I would definitely supplement it with a full set of bore squeegees. A cleaning jag is also designed to be used directly after the bronze brush and is usually a brass or plastic piece of metal that is sized slightly less than the diameter of your bore. This is so that you can place a cleaning patch over the jag and push it through the bore. The patch soaks up the solvent and fouling and is discarded and replaced with another patch. This process is repeated until the patches come out clean (this can sometimes take a long time). You can also use the cleaning jag to push an oil-soaked patch through the bore which will give it a light coat of oil and protect it from rust. A slotted tip functions very similarly to a cleaning jag. It is also used as a method for pushing a cleaning patch through the bore. The difference is, a slotted tip is usually one of several standard sizes, and the patch runs through the slot and is wrapped up and around the tip to fit inside the bore. Many of your cheaper kits will elect to have slotted tips instead of cleaning jags, as they can be made cheaper and the kit can have fewer of them. As such, they are slightly more difficult to use than cleaning jags. Cleaning patches are a consumable item that is almost always included in reloading kits. These are simple square cotton patches designed to be used with a cleaning jag or slotted tip in order to soak up and remove fouling and solvent from the inside of the bore. Most cleaning kits come with cheap, thin patches that don’t work very well, so I would plan on making your own out of old clothing. The added bonus to this is that you can use the larger chunks to make your own cleaning rags, and the smaller chunks can be cut into patches. I have found that old work t-shirts make the best cleaning patches. They are cheap, easy to make, and much better than the ones often included in kits. The final portion of the tools needed to clean your bore is the rod. This is a long stick that each individual cleaning component screws into. While single-piece cleaning rods are very nice, they take up a lot of space and can be very expensive. Due to this, most cleaning kits will include a multi-piece cleaning rod. 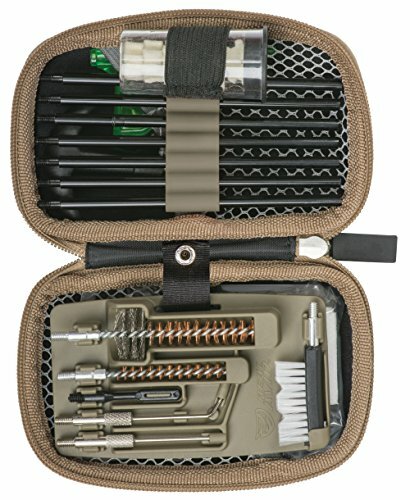 If you are looking for a good universal gun cleaning kit, you will want to make sure your kit contains at least 2, maybe even 3 different rods. You will want a rod that is skinny enough to fit down the barrel of a .17 caliber rifle, but that thin rod will be far too weak to push your large brush down the barrel of your 12 gauge. For that, you will want a rod that is much stronger and thicker. For this, you will need at least 2 different rods in your universal cleaning kit. An option today that is ever increasing in popularity is a flexible cleaning rod. These are made of steel cable and should be coated in order to ensure that they do not scratch the inside of your bore. While you are not able to use these cables to push, they are excellent at pulling your tools through the bore. They are also compact, which not only makes them easy to store but also easy to use, especially on longer barrels. If you are cleaning a 30-inch shotgun barrel, you are also going to need at least a 30-inch cleaning rod. When you first start with your cleaning stroke, you are trying to control 60 inches of tube! This can be difficult and can result in broken equipment and inefficient cleaning. While they are not great for everything, they certainly make some tasks easier and definitely deserve their place in a cleaning kit. Once you’ve got everything you need to clean your bore, it’s time to move on to your general cleaning tools. These will be tools you will use to clean your receiver and other basic components of your firearm. A gun cleaning kit may include some, all, or even none of these tools. Not all of them are completely necessary, but they will certainly help you get your firearm much cleaner and make your job much easier. A good set of utility brushes are one of the most important general cleaning tools. These typically resemble toothbrushes and have different head styles and materials. Your 3 basic materials are going to be bronze, nylon, and steel. The steel brush is to be used very carefully, and only for the very stubborn fouling, as it can scratch the metal in your firearm much easier than the bronze or nylon. I utilize the bronze brush the most, as it is good for removing stuck on grime, yet gentle enough not to score the surface of your metal components. The nylon brush is good for removing light fouling and dirt from sensitive, or finished components. You don’t have to worry about scratching your bluing or scoring your polymer with a nylon brush. Different head styles are also important. These will usually come in normal, 2 headed and notched. The 2 headed style is by far my favorite, as it includes both one normal and one small head on opposite ends of the same brush. This brush is very handy because you can use the large head to remove stuck on fouling and carbon from larger areas, and the small head is excellent for getting into small crevices and other hard to reach areas in your receiver. This brush is also much more durable and stiffer, as it has shorter bristles that don’t bend as easily. The notched head brush is also handy to have, as it allows you to clean around rails and other protrusions much easier. Cleaning swabs are another necessary tool to have in your kit if you plan on doing any detailed cleaning. You can get cotton swabs in various styles and lengths, but this is usually something you will have to buy separately from a cleaning kit. You can spend oodles of money on fancy gun cleaning cotton swabs, but by far the most cost-effective method is to raid your wife’s beauty cabinet for Q-tips. That’s right, this common household staple is good for much more than applying makeup or cleaning your ears. The soft, absorbent cotton is excellent for soaking up solvent, applying oil, or wiping clean those hard to reach areas. A good pick is probably one of the most underrated cleaning tools you can have in your kit. A good pick (like the ones they use at the dental office) can be the difference between a basic quick clean and a thorough, deep clean of your firearm. These picks allow you reach deep into the crevices of your firearm and scrape away fouling that you can’t get with your utility brushes. Not very many gun cleaning kits will include a pick, but these are easily attainable on their own. The best set of picks will include both plastic and metal picks to be used for different scenarios. Most metal picks included in gun cleaning kits will have 2 sides, one straight flattened side (almost like a flathead screwdriver) and another bent sharp side. Another bonus use of a good pick is this bent sharp side. It can be used to easily hook and retrieve small parts that have fallen in hard to reach areas. I have no idea how many times I have used my pick to fish out a small trigger spring that fell into the deep recesses of my receiver. While cleaning swabs are great, you can easily get a large pile of them when you are cleaning a dirty firearm. For larger cleanup jobs, I like to have a good set of cleaning rags handy. While not many gun cleaning kits will include a cleaning rag, I like to make my own out of old T-shirts or other worn out clothing. I have found that a thick cotton work sock (preferably a worn-out one with a few holes) works exceptionally well. With this option, you can put it over your hand like a glove and use your fingers to get deeper inside the receiver to wipe away much more solvent and fouling. Whatever you decide to use, a few good cleaning rags are going to be an essential addition to any kit. While many store-bought cleaning kits fail to include many consumable items, they are still something that is essential to getting a proper clean of your firearm. While some people think that a good CLP is all you need to properly clean your guns, the reality is that there are far more task-specific and better options out there. Your cleaning chemicals can be broken down into two basic categories: solvents, and lubricants. Solvents are used to dissolve metal deposits, carbon, and fouling, while lubricants are used to protect your metal components and ensure smooth operation. A solvent is one of the most important parts of your cleaning regimen. Most of the time, you will want several solvents in order to get your firearms as clean as they can be. What solvents you choose will mostly depend on the type of ammo you are shooting. For example, if you are shooting a lot of copper jacketed bullets, you will want to make sure that you get a solvent that is good for breaking down copper fouling. This is a very important thing to remember because many of the cheaper solvents are not good at breaking down copper fouling. I typically try to stick with some sort of Hoppes brand solvents. In most of my gun cleaning experience, I have found that Hoppes produces some of the best solvents, and has a wide variety of products to fit every need. A common mistake that many people make is thinking that solvent is also a lubricant. This is a very dangerous mistake to make. Solvents are designed for one thing and one thing only: to dissolve fouling. While they may look and feel like they would do a good job lubricating your firearm, they most certainly won’t. Solvents evaporate very quickly and will leave your metal unprotected and prone to rust. This is why it’s very important to remove all of the solvents when you are done cleaning and give everything a light coat of oil. A good oil is going to be the final part of your gun cleaning process. In a firearm, oil serves 2 purposes. First, it acts as a lubricant. Second, it acts as a rust inhibitor. Every single metal part in your firearm should get a very light coat of oil. I won’t be going to in-depth into different oil types in this article, but it is generally considered best to stick with something that comes in a bottle and avoid aerosol products such as rem-oil. These products look easy and convenient to use but are terrible when it comes to rust prevention and lubrication. You will be much better off sticking with a heavy, viscous gun oil. Many people make the mistake of thinking that a good CLP is the only chemical that you need in your gun cleaning kit. CLP stands for Clean, Lubricate, and Protect. Sounds great, right? Not really. While a good CLP certainly has its place in your gun cleaning kit, it is far from the be-all, end-all solution to your oil and solvent needs. CLP works great as an emergency cleaner, and its place is very firmly in my emergency gun cleaning kit. I always carry a bottle of it when I attend shooting competitions, as it is excellent for a quick and messy spray to get my gun back up and running again between stages. This is a very short-term solution, however, as it generally makes a mess and really only spreads the fouling out throughout the internal components of your firearm. While CLP certainly has its place in your gun cleaning kit, it should never be the first thing you reach for. One of the major downsides to any liquid lubrication will be that it attracts dirt and fouling. Oil and grease will quickly turn to sludge in any gun that runs dirty, and that is a recipe for disaster. Dry lubricant is not the best lubricant that there is, but I use it in almost all of my gas operated firearms. Gas operated shotguns and direct impingement rifles, such as the AR-15, are notorious for requiring meticulous cleaning and being very finicky. In order to help with this, I use a good dry lubricant on pistons and any other components that come in direct contact with gases used to cycle the action. This results in increased reliability and smoother function of my firearms. Dry lubricant is expensive and not quite as good as oil, however, so be sure and use it only on the necessary components. A good grease is a very uncommon, but still necessary component of a good gun cleaning kit. The old adage is “if it rotates, oil it. If it slides, grease it.” This is mostly still true when it comes to lubricating your firearms. While the primary purpose of grease has nothing to do with actually cleaning your firearm or protecting the metal from rust, it does go a long way to ensure that your firearms continue to function smoothly and without error during operation. Most firearms are designed to be field-stripped for basic cleaning with minimal tools. While this is great for a quick cleaning in the field, you are more than likely going to want to completely disassemble your firearm at home for a thorough cleaning. Doing this is more than likely going to take a few simple hand tools. Most firearms are held together with pins and screws, so a good gunsmithing screwdriver set and some punches are a good addition to any kit. A good set of punches is going to be a very valuable addition to your kit. Some kits will include a few punches, but it is also a good idea to supplement this with at least one, but ideally several, full punch kits of your own. Ideally, you will want punches made of 3 separate materials: steel, brass, and plastic. Each material type has its own unique advantages and specific uses. The most common type of punch is going to be brass. A brass punch is one of the softer metals, so it will not mar your receiver or other components as easily. It is also sturdy enough to allow you to use a stout hammer in order to drive out tough pins. A good set of brass punches will last you a long time, but not forever. By design, brass punches will “mushroom” over and deform. This is actually a good thing, as it means that you are deforming your punch and not your firearm. Probably the least important group of these 3 materials is going to be plastic. Plastic punches are not very good for driving out stubborn pins, but they certainly have their place. I typically use plastic punches when I don’t need to use a hammer. This prevents me from making any errant scratches in the finish of my receiver. They are also good for using as slave pins, or a temporary pin used to hold your components in place while you drive in the actual pin. Steel punches are also very important to have in your set. Since steel is a much harder material, these punches can be both thinner and longer than brass punches. This will allow you to drive out both longer pins and thinner pins. The longer steel punches also make much better slave pins. You will have to be very careful with steel punches, however, as they can often mar your finish or even deform your pins. Too much use of a hard steel punch can cause the end of the pin to mushroom over, and it will no longer fit properly in your firearm. Another bonus use of the long steel punch is a makeshift cleaning swab. I like to cover the end of the punch with a cleaning rag and use it to get into hard to reach places that are still too big for my small cotton swabs. A good screwdriver set is also very important to completely disassemble your firearm. Almost every firearm will require the use of a screwdriver at some point, and these screws can range from incredibly tiny, to very large. Since a screwdriver set large enough to handle almost any screw you encounter would take up a lot of space, a great solution to this problem is to have a single driver with interchangeable bits. 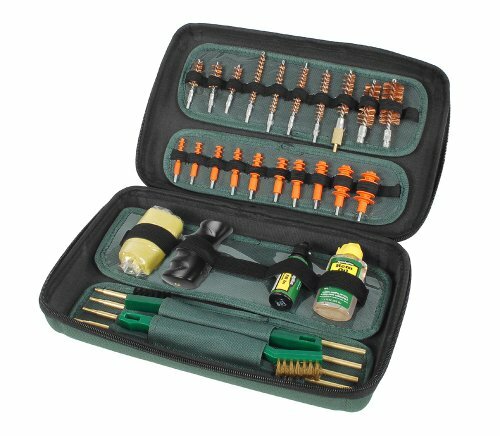 You can find many specialty gunsmithing screwdriver sets that include hundreds of different bits, yet still fit in a small, compact case. These are by far the best option unless you have lots of money and storage space to use on a tool that will receive relatively little use. When you think about precision firearms, the thought of beating on it with a hammer probably doesn’t cross your mind. However, this is the reality in many cases. Throughout your experience with firearms, you will find that many of these precise instruments are indeed very hardy, and will need quite a bit of “gentle persuasion” from time to time. This does not mean go out to your garage and start wailing on your Glock with a sledgehammer. A gunsmithing hammer set will be a precise set of tools designed specifically to be used on firearms. A good gun cleaning kit will have 3 different types of hammers. First, you will have a good plastic or rubber-headed hammer. This is to be used for gently tapping in pins or parts into place. If you need a bit more oomph than a lightweight tap, you can step up to a brass hammer. This will have a bit more weight and be much harder than your plastic hammer, but will still be soft enough to avoid any major damage to your firearm. A larger steel hammer should also be included in your kit, but should only be used when all other options have been exhausted. While most of the following miscellaneous tools are almost never found in off-the-shelf gun cleaning kits, they are all great additions to your cleaning setup, and I use almost all of them on a regular basis. Most of these are very underrated tools to have in a cleaning kit and may seem a bit ridiculous at first until you find yourself in a situation where you need them. If you really want to get serious about keeping your guns in tip-top shape, then you may want to consider investing in some of these tools. If you have ever been to a jeweler or watch repairman, you have probably seen them intently scrutinizing some small object under a magnifying visor. Much like jewels and watches, firearms also have a multitude of tiny components that need inspected and cleaned on a regular basis. Most of the time, basic unaided sight is more than adequate to get these parts cleaned. But if you really want to make sure everything is perfect, you need a magnifying visor. I know, I know, you are probably laughing at this suggestion. But these devices are actually very affordable, and I find myself using mine almost every time I clean my guns. Once you try one, it will be hard to go back. There are few things more frustrating than trying to work on a firearm or small part, only to have it slide all over the table or not stay in the place that you need it to. For this, a good set of clamps is excellent. I like to use a basic set of rubber Milwaukee hand clamps. They are great for holding large parts exactly where I want them, all while leaving your finish in good condition. For smaller and more hardy parts, I like to use a good set of vice grips or other locking pliers. You will need to be careful with these so as to not mar your finish, but they are a great tool to have on hand. A good gun vice makes a fantastic addition to any gun cleaning kit. These can be a bit expensive, but there is simply no nicer way to work on your guns than to have it perfectly cradled and held rock solid in a vice. I personally like to use my Tipton best gun vice. It has padded cradles for the stock and forend and has screw locks to hold it nice and secure. It is fully adjustable and has quite a few accessories, including a magwell lock to securely hold your AR-15 lower receiver. A good rotary tool, such as a Dremel, can also be very valuable in a gun cleaning kit. These tools have a multitude of attachments, from grinders to sanders, to polishers. While you really won’t use this very often while cleaning your guns, it is certainly handy to have a bit of power for those really tough cleaning jobs. They are also great for sanding down burrs or polishing your components to give you an even smoother operation. Are you looking for a fast and easy way to clean your rifle bore that is cheap and easy? Perhaps you enjoy shooting corrosive ammo, or you just like to take very good care of your barrels by cleaning them before you even get home from the range. If so, then the original BoreSnake from Hoppe’s will make a good addition to your cleaning kit. 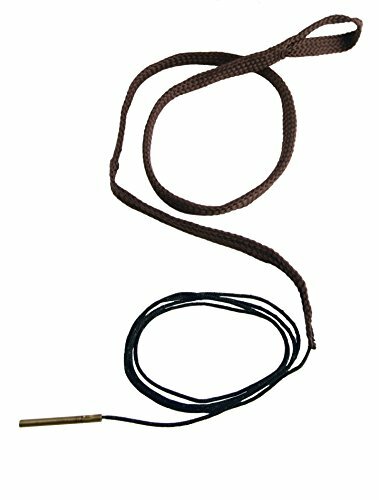 Boresnakes are very popular among rifle shooters, and for a very good reason. Each snake contains 3 cleaning components: an initial patch to wipe away loose fouling, a brass brush to really scrub the bore, and finally a large cotton cleaning area that is 160 times larger than a standard patch. This means that one or two passes through your bore are all you need to get your barrel squeaky clean! While the Boresnake is very popular, that does not make it free of shortcomings. The truth of the matter is, the boresnake simply can’t be the only tool in your cleaning kit. It is great for cleaning the bore of your rifle, but that is all. It includes no takedown or disassembly tools, utility brushes, or even solvents or oils. While this tool is certainly a great start or addition to any gun cleaning kit, there are still quite a few other tools you will need. If you need a kit that is compact and portable for use at the range but still retains a wide variety of functions and the ability to clean almost every firearm you own, then this Real Avid may be the kit for you. 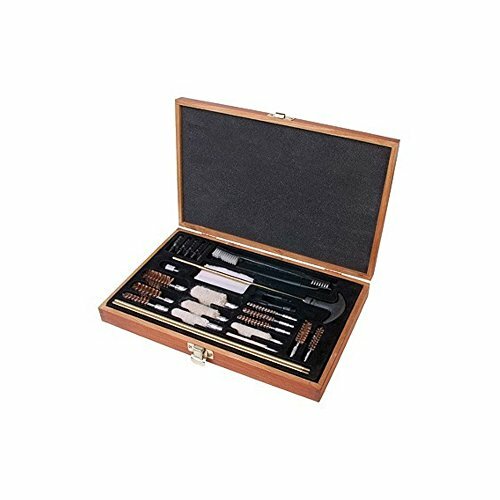 This kit includes the necessary bronze brushes, large mops, slotted tips, cleaning patches and cables to clean almost any size firearm, from a .22 handgun to your 12 gauge shotgun. One nice feature of this kit is that it includes 2 separate plastic coated cables to use as your cleaning rods. In most scenarios, I much prefer these to hard multi-piece cleaning rods and they are much more compact to boot. One of the few downsides to this kit is it is not very thorough. As I am sure you noticed, it only contains bore cleaning supplies, and no oil or solvent. This can be very problematic if you are wanting to do a deeper clean of your firearm, but then again that is not what this kit is for. This kit was designed to be compact, effective, and a good way to quickly clean all of your guns on the go, and it does that very well. If that is what you are looking for, then this kit is worth looking into. If you are looking for a compact an affordable cleaning kit that is loaded with features specifically for the AR-15 style of rifle, then you are definitely going to want to check out this kit. This kit is designed with one thing in mind, and that is quickly and efficiently cleaning your AR-15 rifle. It does that with specialized tools, such as a special bronze chamber brush and star chamber pads to really get your chamber clean. It also includes a utility brush, several picks, and a 3 in 1 cleaning tool that illuminates the bore, drives out takedown pins and acts as an empty chamber flag. As I’m sure you figured out by now, the main downside to this kit is that it is AR-15 specific. This means you are spending your hard earned money on a kit that is really only good for cleaning one specific type of rifle. Obviously, this is a no-brainer if you only have an AR pattern rifle, or choose to shoot that primarily, but if this type of rifle makes up a small percentage of your collection, then you may want to visit some other options. Another downside is its failure to include any cleaning jags. It does have a slotted tip, but I have found jags to be far more preferable when cleaning any rifle. The 7 section cleaning rod can also be a bear to put together and use. All things considered, I would highly recommend this kit to anybody who is looking for something specifically for an AR-15. If you are wanting a universal kit, it would be wise to spend your money elsewhere. If you are a one-stop shopper and are wanting to get all of the basics in one simple, easy to use, no frills kit, then this may be the option for you. This kit really outshines all of the others with its inclusion of a high-quality oil and solvent. 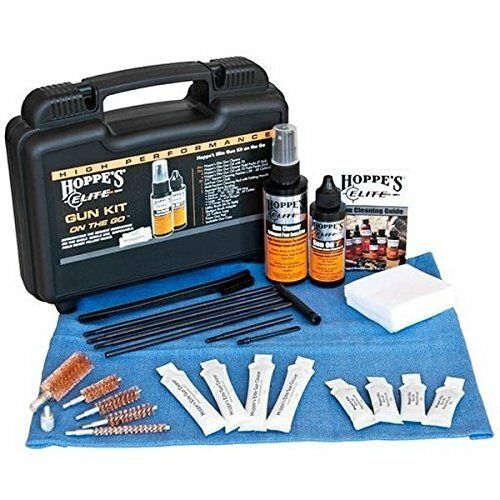 Hoppe’s is generally considered to be one of the best when it comes to oils and solvents, and this kit includes a 4-ounce bottle of Hoppe’s elite gun cleaner (my personal favorite solvent) and a 2-ounce bottle of Hoppe’s elite gun oil. It also includes everything else you will need to effectively clean your firearms, including a utility brush, patches, cleaning cloth, bronze brushes ranging from .22 to 12 gauge, and a loop tip for your patches. While this kit truly is a basic one stop shop for cleaning supplies, that is not always what you want in a cleaning kit. This kit also lacks a few features found in the larger, nicer kits. For example, this kit only includes 5 bronze bore brushes. While this will be fine for most people, if you have a weird or oddball caliber firearm, you might not be able to find a brush that will fit. It also lacks any sort of cleaning jag assortment, which is a large downside for me. Overall, if you are only able to purchase one kit to clean your guns and nothing else, this would be my go-to. Otherwise, you will have much better luck getting your oil and solvents elsewhere and focusing on a kit with the most equipment. If you are getting into 3-gun competitions and looking for a great kit to carry in your range cart, then you may want to give this M-Pro 7 kit a look. This kit is designed with the competition shooter in mind and is tailored to their specific needs. Most 3-gun shooters, like myself, stick to the tried and true combination: a 9mm pistol, a 5.56/.223 caliber rifle, and a 12 gauge shotgun. Coincidentally, this kit includes boresnakes in those 3 bore sizes! It also includes a nylon utility brush, cleaning cloth, and a small bottle of solvent and oil. While this kit makes a great addition to your 3-gun cart, it is not good for much other than quick maintenance in between stages. For a more detailed and involved cleaning of a poorly maintained firearm, you are going to need far more equipment and chemicals. However, if you have shot 3-gun long enough, odds are you have experienced a firearm malfunction during a stage, no matter how well you take care of your guns before and after the match. In situations like those, it can give you a lot of peace of mind knowing you have the tools to service your firearm after the stage and get it back into tip-top shape. 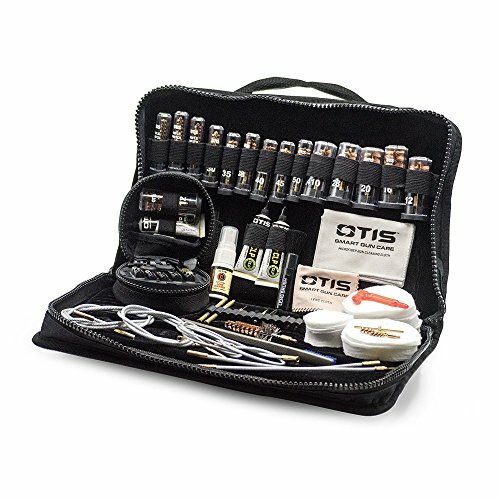 If you absolutely have to have a high-quality, all-inclusive kit and aren’t afraid to pay for it, then you may want to look at this elite range box from Otis. This includes everything you need to clean almost any firearm and is loaded with extra features. This kit comes with a wide variety of brushes, picks, scrapers and specialty tools to make any cleaning job a breeze. It even includes a small assortment of cleaners and lubricants to help get you started. All of this is neatly contained in a hard plastic case to keep everything organized and in good condition. There is no doubt about it, this is one of the better gun cleaning kits on the market today. It is also one of the most expensive. The simple fact of the matter is, you can find kits of comparable quality for far less money, even if that means buying multiple components or tools to complete your own kit. If the thought of piecing together your own set of cleaning tools and chemicals doesn’t appeal to you, and you’re not afraid to drop a chunk of change, this would be a good kit to look in to. If your collection consists primarily of firearms with optics on them, then this is a specialized kit that you may want to consider. What sets this kit apart from all of the others on the market is that this one includes a lens tissue, spray, brush, and cloth. It also includes many other specialized tools and handy extras to make sure that you can get the rest of your gun clean as well, and comes with a great warranty. All of this is neatly organized in a soft-sided case. As with most high-end and specialized gun cleaning kits, the major downfall of this kit is the price. While certainly not the most expensive option in this list, you will pay far more for this kit than many others, with the only main benefit being the optics cleaning supplies. But for somebody who has a large amount of optics that need to be taken care of, such as a benchrest shooter, this could be the best option. If taking care of your optics is just as important to you as taking care of your firearms, then it may be worth the money for you to get this kit. 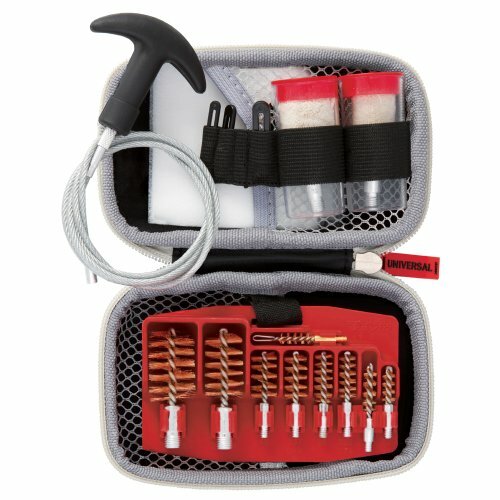 If you want to get almost everything you need in a gun cleaning kit without spending a lot of money, then this basic universal cleaning kit from Winchester will more than likely fit the bill. More often than not, this is the kit that I find myself reaching for whenever I need to clean my firearms, as it checks almost every box that I look for in a good, thorough kit (including the price). Most important to me, this kit includes a 13 piece brass cleaning jag set, something not seen very often in other kits in this price range. It also includes an excellent assortment of utility brushes and picks to really get into the crevices of your firearm. Another great feature of this kit is how everything is stored. Each bronze brush and mop has its own individual storage tube to help keep them from getting mixed up or lost. As with any kit in this price range, it is not without its downfalls. For starters, the included cleaning rods are finicky to use and not very sturdy, although that is a feature of many multi-piece cleaning rods. Purchasing a good single piece replacement or going with flexible cleaning rods is a good option here. You will also find that the soft sided case is quite flimsy and not very attractive. However, these are minor grievances for a kit in this price range. 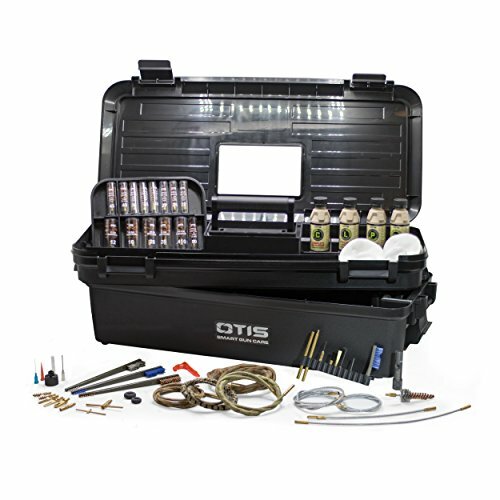 Overall, this kit offers some of the best value there is in the gun cleaning market. If you are on a very strict budget and are looking for a decent universal cleaning kit that won’t break the bank, then this Outers kit is a good option to consider. 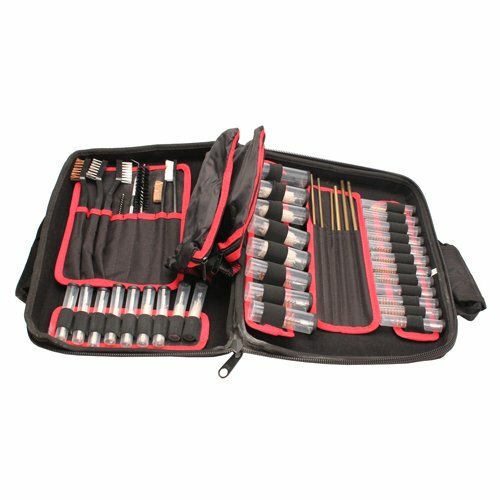 This kit is loaded with features and includes a double-sided utility brush, cleaning pick, 3 pieces cleaning rod, bore brushes, mops, and a set of plastic cleaning jags. This includes just about everything you will need to give your firearms a good clean, minus the oil and solvent. The best part of this kit is that it comes in an attractive wooden case, all at a price point that is easily affordable. Obviously, cheap is the name of the game with this kit, and that shows in the overall quality. For starters, the cleaning rod is pretty bad and fits very tightly down the barrel of a .22lr. Like most 3 piece cleaning rods, it is very flimsy and prone to breaking at the joints, so you will have to be careful with it. It also only includes plastic cleaning jags instead of brass. Most of the time this is not an issue, but I much prefer a nice set of brass jags over cheap plastic ones. Overall, this is a good introductory or budget kit. If you are wanting something that will get your guns clean without spending a lot of money, this may be the kit for you. There are two groups of people when it comes to gun cleaning supplies: those who love the bore Squeeg-E system, and those who haven’t tried it yet. In my opinion, this cleaning system from Remington has revolutionized the way I clean my guns. No more piles of dirty patches in the corner of the workbench. Instead of running patch after patch through the bore and still having them come out dirty, just wipe the bore down with this squeegee a time or two, and then go rinse it off in the sink. While I am the first to admit that I have been very displeased with Remington’s products over the past several years, I couldn’t be happier with the performance of their bore Squeeg-E system. This cleaning kit comes complete with a full set of bore squeeg-Es, as well as a couple utility brushes, bronze bore brushes, solvent, oil, and a 4 piece cleaning rod. Coming from Remington, this kit obviously has a few downsides. For starters, it is heavily lacking in the extra tools department. While it does come with 2 decent utility brushes, it includes no picks or other basic cleaning tools. The 4 piece cleaning rod is also flimsy and a pain to use. Finally, the oil and solvent included in the kit come in way under par and are by far my least favorite products to use. While I admit that I do use rem-oil occasionally, it is only in very rare circumstances and I cringe when I do it. All things considered, this is a great kit to buy if you are wanting the bore Squeeg-E system. Otherwise, not so much. Let’s face it: if you own a firearm, you are going to have to take care of it, and that requires a cleaning kit. If you want the best cleaning kit that is going to suit all of your needs and clean every firearm that you own, you are going to need a kit that includes a wide variety of brushes, jags, and general utility tools. You’re going to need a kit that has everything you need to get into every nook and cranny of your firearm and scrub it clean. While all of the kits listed above are great options, there are two that stand out above the rest. The universal kit from Winchester includes everything you need to get your firearms squeaky clean (minus oil and solvent), and the universal Squeeg-E kit from Remington will get any gun clean in a snap without a pile of dirty rags at the end. At this point, it comes down to purely personal preference, whether you prefer to use cleaning jags or the Squeeg-E system. Either way, it would be almost impossible to go wrong with either cleaning kit. So now that you have all the information that you need, you can go out and purchase the best cleaning kit for you today!